ANU has announced that it will guarantee accommodation to first-year postgraduate students from 2021. The Postgraduate and Research Students’ Association (PARSA) has been pushing for the change in a number of campaigns this year. PARSA has been campaigning for this guarantee since the beginning of the year. In February, it released a report which found that 57% of postgraduate students had no arrangements before arriving in the ACT, and that 9% of respondents were currently homeless or at risk of homelessness. 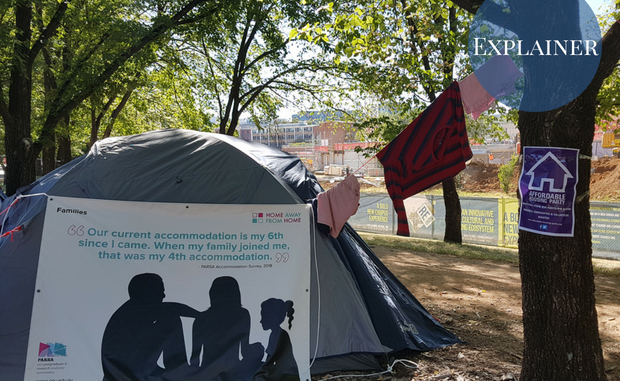 The Association set up an installation of tents and signage during O-Week to raise awareness. For the past fortnight, a student-created photography exhibition entitled Home Away From Home has been running in the Pop-Up gallery. PARSA has also been encouraging students to email Vice-Chancellor Brian Schmidt and other University executives calling for the guarantee and other measures. PARSA President Alyssa Shaw told Observer that “PARSA welcomes the ANU announcement”. However, she highlighted the need to continue “support[ing] students who are struggling to find affordable and appropriate accommodation” in the time before the 2021 guarantee. “PARSA knows there is a pressing need to support postgraduates and remains committed to solving this issue so every postgraduate has a place to call home,” she said. PARSA has previously suggested “Repurposing…Other Accommodation in O-Week Periods”, building “temporary emergency accommodation” such as demountables. In response to questions from Observer, an ANU spokesperson reiterated the university’s ‘initiatives’ to ‘boost accommodation places for postgraduate students across the campus’, but did not comment on where these places are being created. They also alluded to expanding their assistance to postgraduate students in accessing Canberra’s rental market. PARSA will tonight be holding a sleep-out demonstration to “protest the university’s ambivalence to the struggles of…postgraduate students”, according to a media release. At least ten students are expected to spend the night outside the Chancelry building. Temperatures are forecast to drop below zero. Shaw told Observer this action will be about “raising awareness of the issue of student homelessness” and calling on ANU to take “interim measures” between now and 2021. “People are still suffering here and now because of poor processes and a lack of support programs,” she said.